It used to be that when I thought of salad, images of iceberg lettuce would dance through my head. Or maybe Romaine, or mixed greens, or even spinach. The point is, there had to be leafy greens in the bowl for it to be considered a salad in my book. Then I married my husband, and a whole new world of salads was opened to me. Partially because I invested in, or was given as gifts, some great cookbooks, and partially because my husband comes from a different cultural background (Ukrainian), I found out that salad doesn’t require lettuce. It doesn’t! There are whole pages of salad recipes that don’t require a single leafy green! They are composed of just plain vegetables! My mother-in-law makes yummy salads that are completely leaf-free! This was a revelation to me, plus great news, because sometimes I just don’t feel like checking lettuce for bugs, and have had my experiences with bagged lettuce. 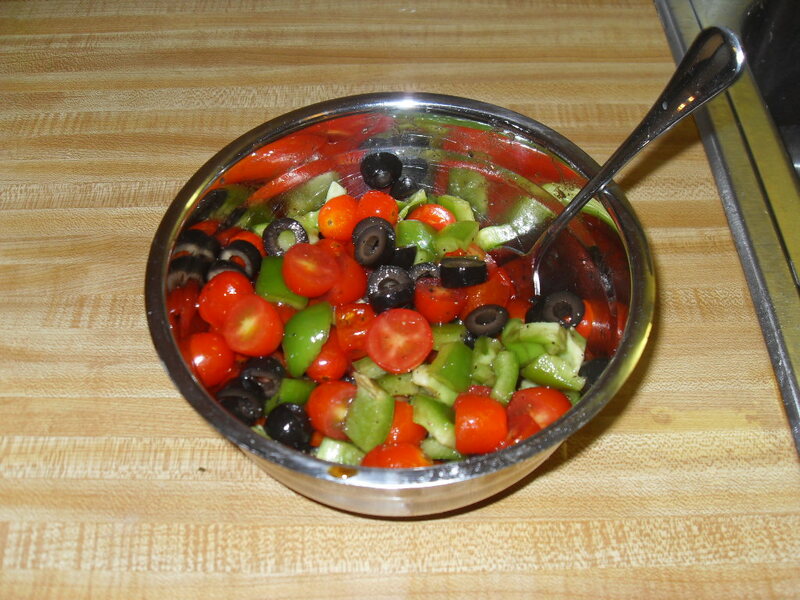 Here is a recipe for a yummy, fresh, leaf-free, quick salad. These are more or less my go-to ingredients for a salad. If there had been a cucumber available, I would’ve thrown it in as well. There are lotsa salads you can make without lettuce. How about good ol’ Israeli salad? Cut up (really small) tomatoes, cucumbers and peppers and spice with oil, salt, garlic powder, onion powder and pepper. There are a ton of salads out there thiese days and I’m always looking for new ideas so thanks for this one! No problem! I love the Israeli salad. My husband prefers them cut up a little bigger than the traditional size, though. Having a non-American husband is such an adventure. Especially when it comes to food- they just have different definitions for everything! I know, right? I was thinking of your cake-for-breakfast reality just the other day. I also like a corn and pickle salad. The dressing is mayo, pickle juice, garlic and dill. If you are into it, pasta with chickpeas and red onion with a oil and garlic salt dressing is great too. There are also the traditional cole slaw as well as cucumber salad.